Can hold condoms, bills, coins etc. 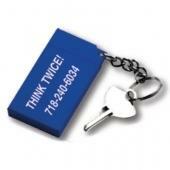 Size: 2-3/4” x 1-1/2” Standard Imprint Area : 2" h x 1 1/8" w. Weight: 100 Pcs. / 10 Lbs. Packaging: Bulk. Buy Condom Keychain (Includes Durex condom) Today!